Welcome back to the new Wonderful Wedding Wednesday feature. If you missed the first last week, catch up on the quintessential English Wedding of Mr and Mrs Webb here. Clare and John met in 2007, when Clare was working for an international airline based out of Heathrow. She had flown to Sydney on an overnight flight and they found themselves in the same bar, on an ordinary Monday night. They never spent more than 3 weeks apart during their 15 month long distance romance and Clare would try and swap her roster, to include as many Honk Kong/Sydney trips as possible, even though that meant just 36 hours together. After countless flights both working and as a passenger and a couple of trips to the UK for John, as well as half way meets in Honk Kong, Clare managed to gain a place on an exchange programme working for the airline's Australian partner for 12 months. But after moving in together immediately, it was clear she was never going home! John proposed to Clare in San Francisco in August 2009. They were just about to cycle over the Golden Gate Bridge to have lunch in Sausalito, with Clare's parents who had flown in from London to meet them for a few days. John surprised Clare with a ring he had designed himself and it was perfect! Returning to Sydney on cloud nine they set the wedding date for just 9 months later on 24th May 2010. They wanted to get married in Europe to include as many of their closet friends and family as possible. As John's mother is half Greek half Italian, a wedding in Italy was high on the list of possible venues. Clare was flicking through Hello magazine one day and saw Gary Lineker’s wedding to Danielle Bux. 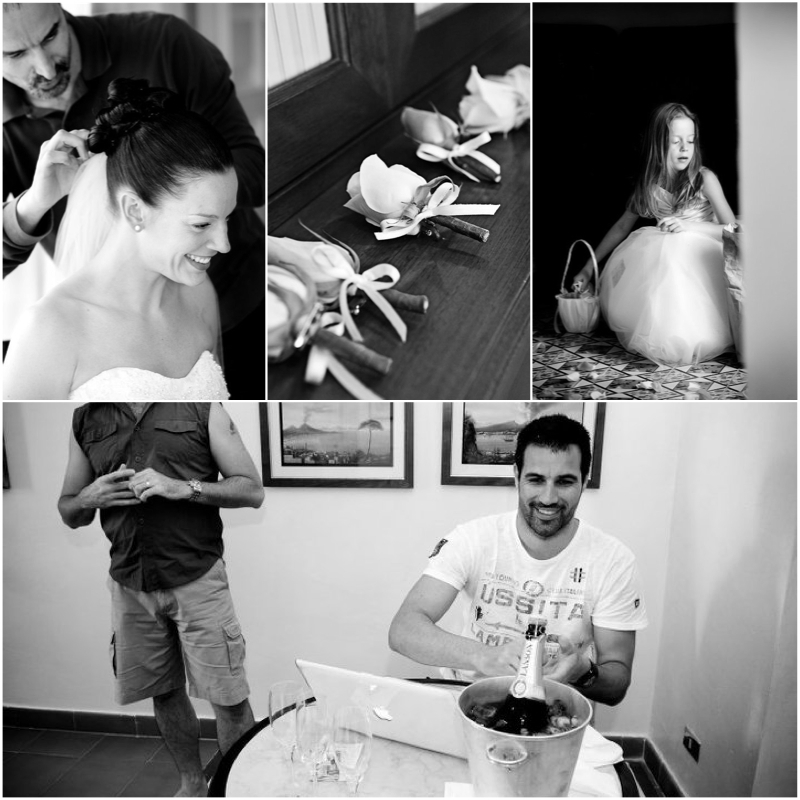 She immediately fell in love with their venue and decided to book the Town Hall and Hotel Caruso in Ravello on the Amalfi coast for their special day. They had just 25 guests. The perfect intimate wedding. Clare said of their incredible day " The most magical part of day was walking in and seeing John waiting for me along with our closest friends and family. The string quartet was playing and it was the most romantic setting, surrounded by beautiful old buildings and flowers. I remember just feeling so lucky and blessed. The day was truly perfect even with the rain, which held off and started the moment the ceremony was over. The rain clouds actually enhanced the photos by the infinity pool and made them very mystical." Clare was so happy she didn't even care that her dress ended up completely soaked by the end of it! Thank you to Susan Wright for letting me share her magical photographs. Clare and John's beautiful daughter Sophia was born in October 2011 and baby Daley number 2 is due in October this year. Congratulations to this very happy family! Next week we are staying close to my home in Weston Super Mare, for the fab wedding of Sam and Marc!